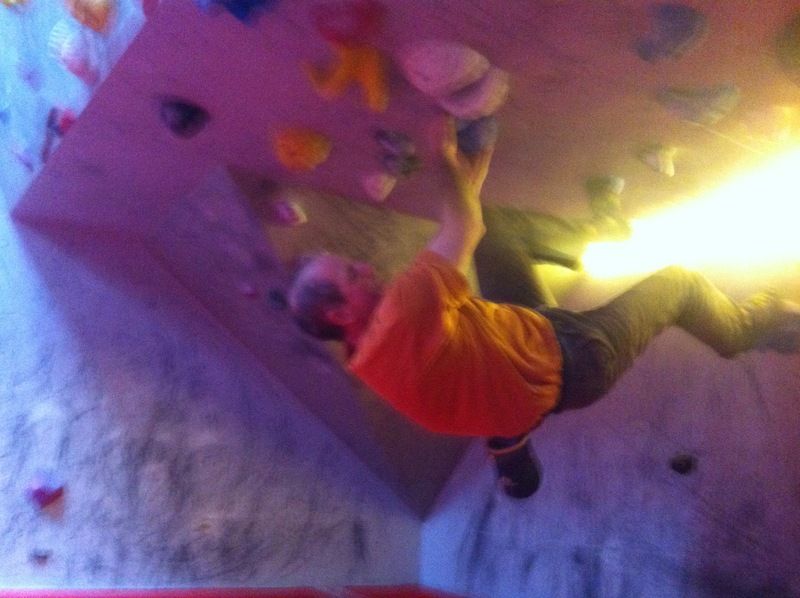 An impromptu session at the red goat (York's premier bouldering establishment) on Saturday morning had a good turn out by club members. After warming up on the yellows, some of which are quite stiff for the grade, and ticking off the remaining blues, still one to do that requires insane amounts of body tension to overcome a roof, we turned our attention to the green routes. After working the route on the slab for a while, plus a coffee break, the more working of the route, we managed to get up another green. That now makes four attempts on green for rob and four completed since the reset, 400% success – because that's how percentages work. Right? 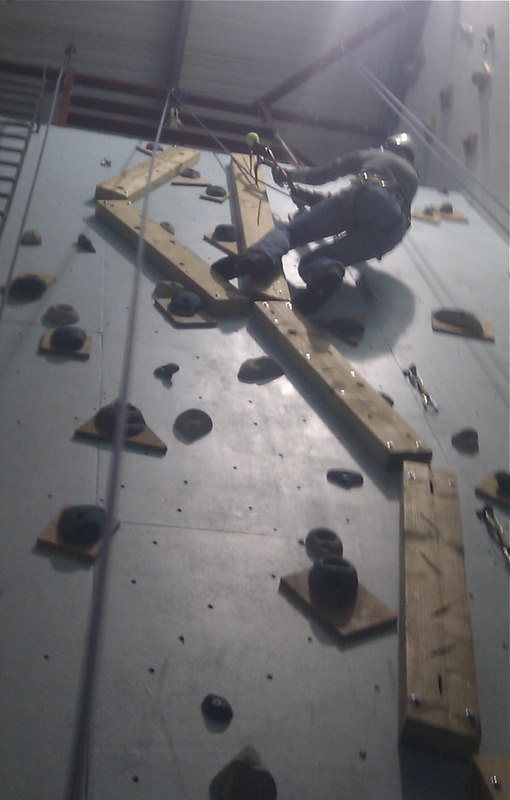 another good turn out at harrogate last night with a dozen members and prospectives pairing up to climb. 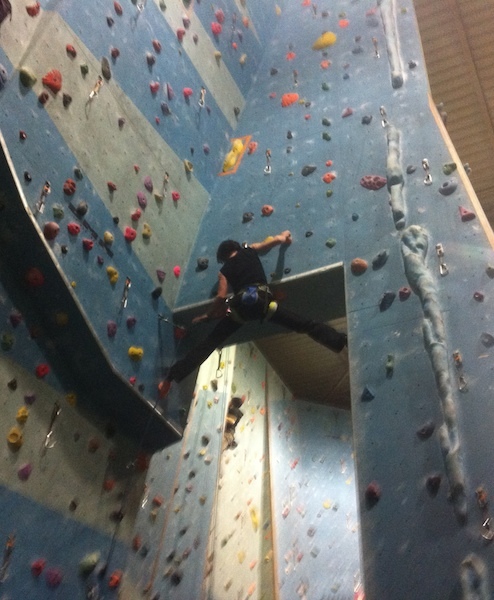 With no new routes since last week we ticked a whole range of grades, Peri managed not to scare any young boys, C3 spanned the arch of doom and dave d attempted a 6c. 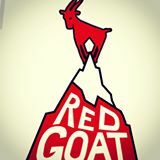 The regular Thursday night at the red goat. There were four here tackling problems when I left. More, I'm told, were on route. Great fun as always. 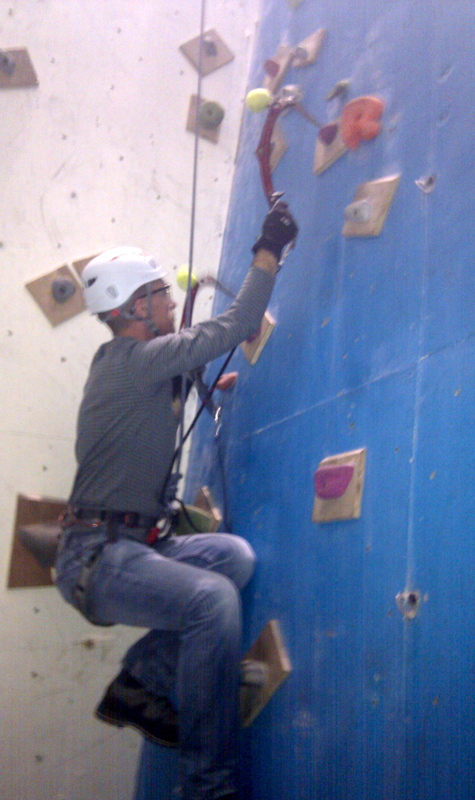 Karl and I headed over to the Leeds Wall on Sunday to play on the dry tooling wall/tower. It's been there a while but i've never been and K had his shiny axes to scratch up. We took big boots to make it feel more real and arrived midday ish at a pretty empty wall (but full car park – kids club I think). There are bunch of routes mostly graded M3..M5, we could't tell much difference between them but were glad it's top rope only. Kitted out in helmets, goggles, boots, gloves and pointy axes we thrashed our way up and down, falling off liberally and generally have a right giggle. In our early struggles i felt there was little subtlety in our style, mostly being of the flail and wild pull type of move. We reckon the grading must be for wearing rock boots, but we didn't care much. Tea and lunch (chips and bacon butty) later we finished up most of the easier routes (there are 2 desperate looking things) including a really good interesting blue M4 with lots of lateral movement and another go at the wooden beams (with slots for torquing – excellent wheeze). Karl decided to finish off by slicing his finger open, luckily the gloves protected him – so only a small flesh wound. Unluckily (for me) they were my gloves he was filling up with blood ! A good fun shoulder busting workout, and a great change from H/Gate or York. 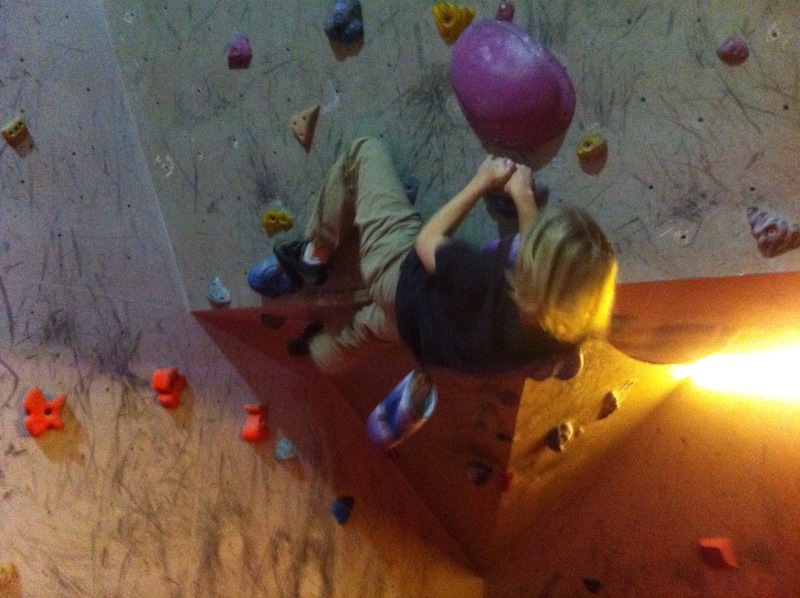 Most people have now decided it's too dark at night and the indoor climbing walls beckon. Last night there were loads of YACers at Harrogate which was surprisingly not too busy. Will, Justine and I met up with Karl and Leni to be joined by Carmen, Gordon and Dave D, with Angela and Catherine already in residence. Look out for the emails (and the bombardment when Peri returns from sunning herself:) discussing options for the weekly session. 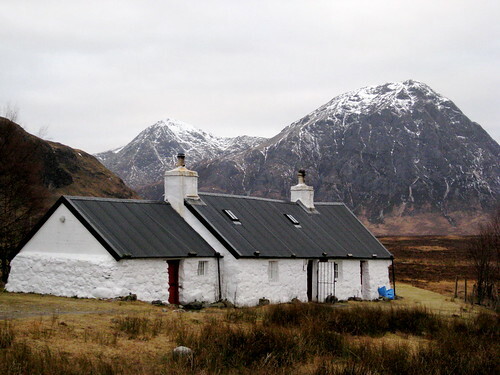 This year we stayed at Blackrock Cottage, Glencoe – a new hut for the club. A few people were put off by the lack of running water (apart from a stream behind the hut), but 7 hardy souls made the trip north – me, Carmen, Simon F, Debra, Peter, Ben, and Peri. Unlike last year, when we had superb conditions throughout our trip, the 2010/11 meet began with a major thaw. We arrived on Monday 27th, and it rained for most of the night. Not to be deterred, Carmen and I went searching for ice the next day, and surprised ourselves by finding some in the form of The Weep (II/III), over 1000 feet of ice on the flanks of Creise. Just when we thought it was all over, having climbed everything that can be seen from the bottom, we turned the corner and found that the ice continued. This provided us with another two long pitches making 8 in all, probably about 350m or more. Mostly easy, but with a couple of grade 3 pitches just above half height, it would make a good route for beginners as for most of the way it is easy to escape and many of the steeper sections can be avoided. We finished with an "interesting" descent as we slowly picked a way through steep crags in fast-disappearing light. Meanwhile the others opted for an ascent of Beinn a' Chrulaiste, a Corbett above the King's House Hotel. Despite limited views they took in the lower summits of Meall Bhalach, and finished in the King's House with some well-deserved beer. The next day being Peri's last chance for some climbing before heading back to feed her iguanadon, she, Ben, and Peter also took a look at The Weep. Continuing mild temperatures meant that it was getting wetter all the time, but even so it was still in good condition. Being a three they were a bit slower, but managed to finish the first half of the route before heading back. Simon, Debra, Carmen and I drove south to tick one of the duller Munros, Meall Ghaordie near Killin, being the closest that Carmen hadn't yet done. A bit of a slog in wet snow, but at least we managed a few long bumslides on the way back down. Thursday's weather was more of the same, mild and cloudy with the permanent threat of rain. Simon. Debra, Peter and Ben headed for the Bridge of Orchy for some more Munro bagging, while Carmen and I decided to see if there was any climbable ice left on Aonach Dubh. There wasn't. So we went shopping for the New Year's Eve haggis instead, and took the opportunity for the first showers of the week courtesy of the Ice Factor. On Friday you've guessed it, it rained. It looked vaguely like it might clear up, so I decided to walk up Bidean while the others went to the climbing wall. Having sat in the car park watching the rain for half an hour, I gave in and joined them at the wall. As is becoming traditional, nobody managed to stay up until midnight. Saturday at last was colder (though not as cold as forecast) and clearer (though not the predicted blue sunny skies). Peter and Ben headed for the two Munros above Allachadair Farm, but had to turn back as Ben wasn't well. The rest of us were booked on an avalanche awareness course with the MCoS, so headed for Aonach Mo where we spent an excellent and very useful on the hill. I'd done a similar course almost 20 years ago, and many of the things I'd been taught then are now rejected as being a waste of time! Conditions were fast improving again, just in time to go home, but we had one more day in which to get something done. Peter went back to Achalladair Farm and successfully bagged the two Munros in good weather, while Carmen and I returned to Aonach Mor, this time for some climbing. It's supposed to be easy to access, but I'm not sure where it gets this reputation as the approach consists of a gondola ride, followed by a 90 minute slog up hill through the ski slopes, and finally a downclimb of a grade I gully to reach the routes. It wouldn't take much longer to get to Ben Nevis! Our first choice route, Left Twin, had a group of 3 just starting (typical, only half a dozen teams on the hill and one of them was on 'our' route), so instead we opted for Tunnel Vision (III *). This turned out to be an excellent choice, much better than it looked from below. I got the 55m middle pitch, up ice and steep neve with worryingly spaced protection (almost all the cracks in the rocks were choked with ice and unusable). We topped out at 2pm and briefly considered another route, but this would have meant missing the last gondola and hence a long walk out in the dark, so since the clouds were rolling in we headed back. The next day it snowed at last, but we were all on our way home. An excellent little hut with bags of character, and I'm sure we'll go back – though given the lack of facilities, maybe not for a whole week! More photos here and Debra's here. …A title clearly needed to follow on from Classic Rock, Hard Rock etc. Trying to outwit the rain had worked pretty successfully so far this week, with our expedition to Brimham on wednesday and Stu's sport climbing extravaganza on saturday, but today (sunday) it broke down. Forecast said much the same as saturday (light showers on and off) so me, clare, debra H and Rob trotted off down the york wall where Debra got some leads in, Clare floated up everything with no apparent effort, Rob scampered up 6cs and much fun was had at my expense as I attempted to use the clip drop technique to desensitise my completely out of proportion fear of falling on bolts. As the day went on we kept nipping outside to check the weather, the predicted rain had failed to appear and it was in fact a warm spring day. Eventually I begged and pleaded to be allowed to divert to Brimham, we all reconvened back at Debras, checked the rainfall radar and calculated (ok, I calculated) that the approaching rain band would have passed when we arrived, so off we set. Ominously, as we got closer, the clouds appeared to be moving in the opposite direction to the expected one, but I had faith. 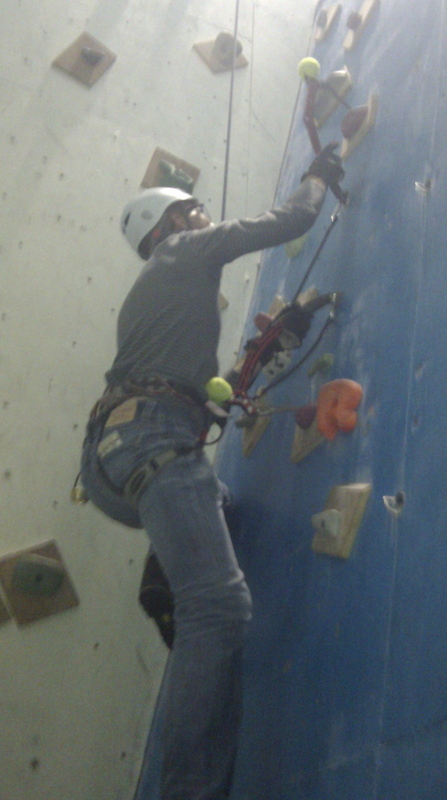 We found a route for Debra to lead, and off she set- just in time for the raindrops to start. Debra succesfully finished her route in pouring rain, Rob decided his planned ascent of Lancet Crack was no longer a goer and we fled back to the car in a tropical downpour. Arrived back home in time to find a mail from Debra headed" what we didnt see on the radar" and a link to the updated radar showing the thundrously dark storm following hot on the heels of the innocuous rain band we had seen first. Calling Dave Meigh, it's 5 o'clock, are you awake? Following several weeks of cold and snowy weather in Scotland, with the best conditions in years, we managed to time our February trip perfectly – at the end of the week of the big thaw. Not to be daunted, we planned a day on the hill and were awake by 5am. Eventually we got back to sleep again, and got up just after 7. My original (pre-thaw) plan had been to take a look at the Inglis Clark Ridge on Creise, a fine grade III. Since this was now completely devoid of snow, Rob, Carmen and I headed instead for Sron na Creise, a grade 3 scramble up the north ridge. 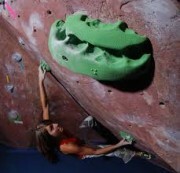 Despite occasional light drizzle, the rock was clean and the friction excellent, with nice exposure in places. And we were sheltered from the strong southerly winds until we eventually reached the summit ridge, where strong gusts occasionally threatened to blow us over. After a brief detour to Clach Leathad (the south summit), we descended east towards Meall a' Bhuiridh, our 2nd Munro of the day. The start of the descent looked fairly desperate, as we appeared to be stepping off the edge of a cornice, but it was actually quite easy, especially in retrospect. From the summit, a long series of standing glissades (ski-ing in walking boots) took us down through the (closed) ski area and back to the car. 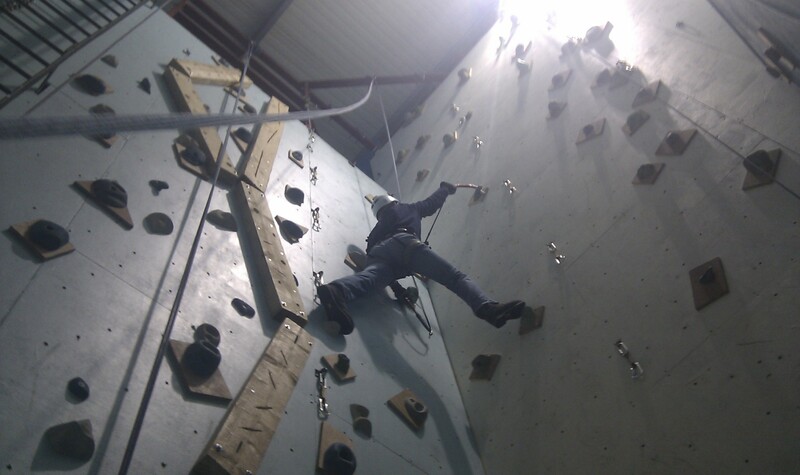 Inspired by an awful weather forecast, the next day we'd already booked in at the Ice Factor indoor ice-climbing wall. Great fun it was too, so much so that most of us booked in for another session in the afternoon. The next day dawned wet and horrible again, but Rob, Dave D, Will, Carmen and I decided to stop off for a walk anyway, and by the time we parked at Ardlui (by Loch Lomond) it was dry, with even occasional glimpses of the sun. Ben Vorlich was a bit of a slog (OK, a lot of a slog), but the bum-slide descent made up for it. You are currently browsing the archives for the Walls category.